Recently I converted a couple of my small raised beds into a circular raised bed garden. It's about 7 feet in diameter, any larger than that and it would be hard to reach the center. It's made from decorative concrete retaining wall blocks that are about 12 inches long, 8 inches wide, and 4 inches high. The advantage to concrete blocks over other raised bed materials is that they will last a very long time! Also if I decide to raise the depth of the soil in the future I just need to add another layer of blocks. For this garden I've planted my spring greens. Three kinds of lettuce and two types of spinach. The red lettuce is called Rouge D'Hiver and is one of the best tasting lettuces I've had. I've also planted Tom Thumb Thumb and Little Gem lettuces. One of the spinach varieties is Bloomsdale Long Standing and the other is a hybrid salad spinach. How to plant the garden above and in what arrangement is up to the gardener. To divide the sections I took three straight sticks and laid them to separate the bed into six pie shaped sections then planted seed in between them. Easy as pie! The advantage to constructing raised bed gardens is that the boards are more easily handled than other materials such as landscape timbers or concrete blocks. Raised bed gardening is a form of gardening in which the soil is formed in 3–4 foot wide beds, which can be of any length or shape. 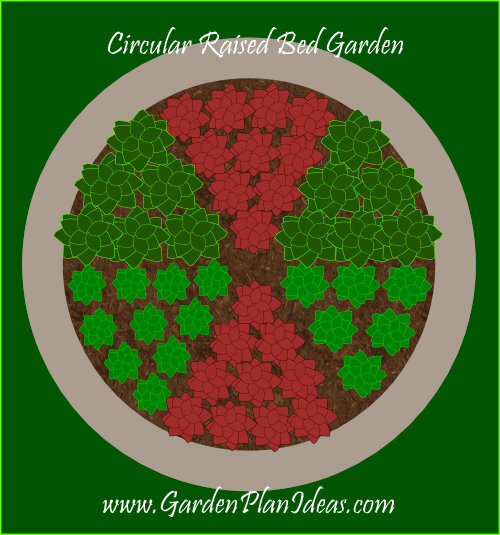 By making a raised bed into a circle or a horseshoe, even more space can be utilized. Thanks a lot.